You may have seen news stories this fall about Indonesia and the blanket of haze choking the country and neighboring countries Singapore and Malaysia. This haze comes from burning carbon rich forests and peat soils for the production of palm oil and other commodities; burning currently releases more greenhouse gases daily than the entire U.S. economy. To address deforestation and the fires and haze it brings, companies that control 90% of palm oil production have pledged to eliminate deforestation from their supply chains. Several major palm oil companies have pledged not to clear High Carbon Stock (HCS) lands—high, medium and low density forests—or peatlands for palm oil and other commodities; instead the companies would shift new production to low carbon stock areas, which are young regenerating forest, scrub or cleared or open lands. The Government of Indonesia pledged to reduce emissions by 26% unilaterally or 41% with international support below a projected “business as usual” baseline by 2020. This year, Indonesia committed to reduce emissions by 29% to 41% below a projected baseline by 2030. In a new report, Environmental Defense Fund explores how companies could eliminate deforestation from their supply chains by preferentially sourcing palm oil and other commodities from provinces in Indonesia that meet criteria for Zero Deforestation Zones (ZDZs). ZDZs would be districts or provinces that align public and private sector actors and are on a path to reaching zero net emissions from deforestation across their jurisdiction while increasing agricultural production. ZDZs would have strong policies in place consistent with the framework Reducing Emissions from Deforestation and forest Degradation (REDD+). Then, companies could source commodities such as timber and palm oil from ZDZs. Revise laws that allow and even encourage deforestation; strengthen law enforcement; and address conflicting agendas between local and regional governments, ministries, and powerful private sector actors. Create a definition for ZDZs that fits Indonesia’s national context. The definition would need to put provinces on pathways to produce zero net emissions from deforestation and comply with UN decisions on REDD+. Set up monitoring systems that both the government and private sector would use to enforce deforestation policies and clarify disputed land claims by local communities and plantations. Provide essential economic incentives to producers to reduce deforestation, increase yields on existing plantations, and shift new production to degraded lands. Figure 1. 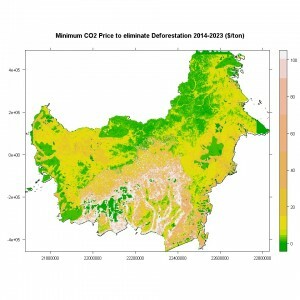 This spatial map shows that the opportunity costs of the land translated into a minimum carbon price (local-specific) needed to eliminate deforestation in Kalimantan, Indonesia, which varies widely by location from $0 to $100 per ton CO2. A carbon price could generate much needed economic incentives to reduce deforestation. To predict the carbon price needed to reduce emission from deforestation, EDF performed a 10-year simulation of deforestation in Kalimantan, Indonesia, using the historical relationship between palm oil revenues per hectare and deforestation rates to estimate landowners’ responses to economic incentives. Kalimantan provides a good case study for Indonesia because it contributes one quarter of Indonesia’s palm oil production. Based on our empirical analysis, the opportunity cost of conserving forest varies widely across Kalimantan. Figure 1 translates the opportunity cost of the land into a price per ton of carbon. 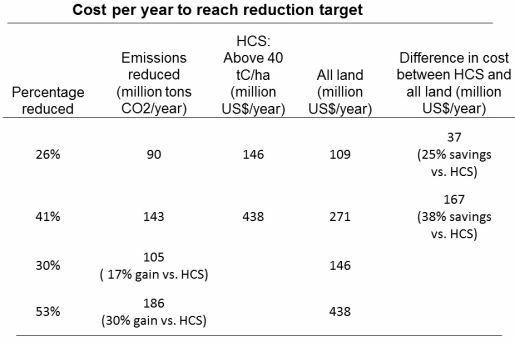 We further compared the cost in terms of dollars per ton of carbon for reducing emissions from deforestation on low carbon stock (LCS, less than 40 t C/ha) and high carbon stock (HCS, more than 40 t C/ha) lands. In Figure 2, at a carbon price of $10/t CO2e, Kalimantan provinces can reduce 75 million tons (Mt) CO2e per year from LCS areas, 185 MtCO2e from HCS areas, and 260 MtCO2e per year from both HCS and LCS areas. 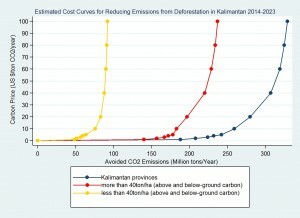 In the latter and highest scenario that conserves both HCS and LCS areas, Kalimantan could reduce emissions from deforestation 74-78% below the scenario without a carbon price. Figure 2. 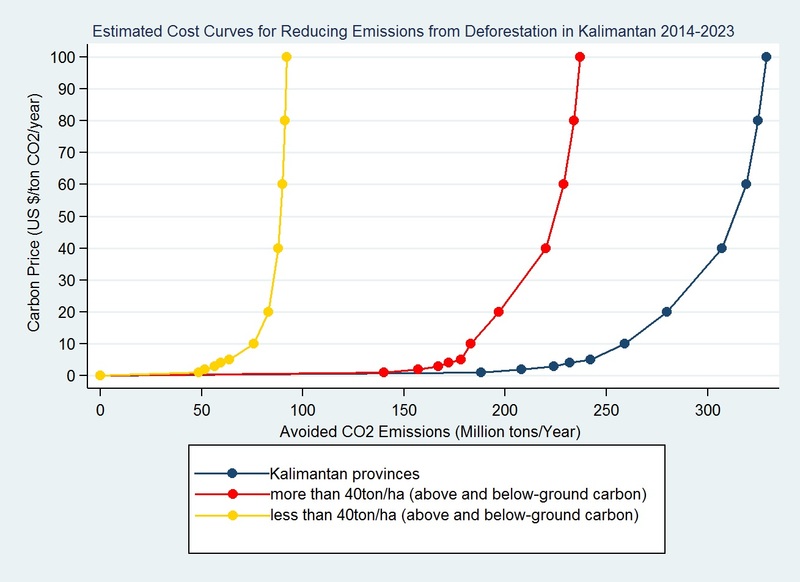 Estimated cost curves for avoiding emissions from deforestation on high carbon stock lands (red), low carbon stock lands (yellow) and all lands (blue) in Kalimantan, Indonesia. This figure shows that more emissions can be avoided if Kalimantan conserves both high carbon stock and low carbon stock lands. This result indicates that more emissions can be avoided at a lower cost if Kalimantan conserves portions of all lands, not just high carbon stock lands. To further illustrate this point, the table below shows that Kalimantan could achieve its contribution to Indonesia’s emission reduction goals of 26% to 41% below business as usual by 2020 at a lower price if both high carbon stock and low carbon stock areas are conserved. This shows that a “Zero Deforestation Zone” approach focused on an entire landscape has the potential to more cost-effectively reduce emissions than an approach focused on just a particular subset of lands. This analysis does not consider the potential for “leakage” or shifts of deforestation from one location to another. Incorporating leakage would lend a further argument for a regional approach that would capture shifts in deforestation across an entire zone. Indonesia has many hurdles to cross before it can level off its rapid deforestation rate and reduce it to zero. But, the haze, health implications, productivity loss and public outrage that ensue from peat fires might just be the wakeup call that Indonesia needs to address its deforestation. Read more in our paper Zero Deforestation Zones in Indonesia; A proposal to curb deforestation and increase agricultural production. Land use—such as agriculture and forests—accounts for almost a quarter of all global greenhouse gas emissions on the planet. The land sector accounts for about 24% of net global greenhouse gas emissions, according to the Intergovernmental Panel on Climate Change. However, it has huge potential to reduce emissions, as well. Forests alone could absorb up to 11% of emissions. 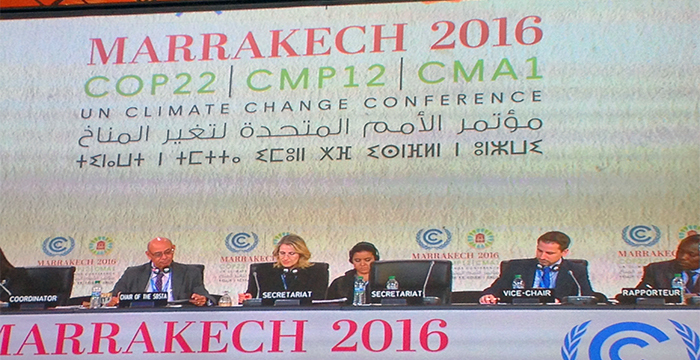 The IPCC also estimates that the land sector could provide 20-60% of cumulative mitigation by 2030. Without significant efforts to reduce emissions and enhance sequestration, it will be very difficult to stabilize warming below 2 degrees Celsius. Representatives from countries around the globe met in Bonn, Germany this month to work on what could be the world’s most grueling but important group project: consolidating 90 pages of text into a global climate agreement to be finalized in Paris this December. Governments and civil society organizations have more work to do before Paris, including ensuring land use is treated in a simple, flexible and ambitious way in the global agreement. One sector that could play a fundamental role in the agreement is the land-use sector, which includes agriculture, forestry, wetland management, and other land management practices.